Standard-grade sponges can be used for applications where sterile gauze is not required. Sponges are produced in a strictly controlled manufacturing process to assure clean, debris-free packaging. Individual packages feature folded edges to prevent unraveling and minimize particulate contamination. Easy-open envelopes are carefully sealed to prevent the intrusion of dust and contaminants. 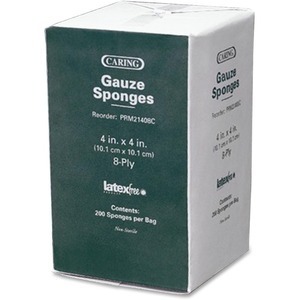 Nonsterile gauze sponges are latex-free.